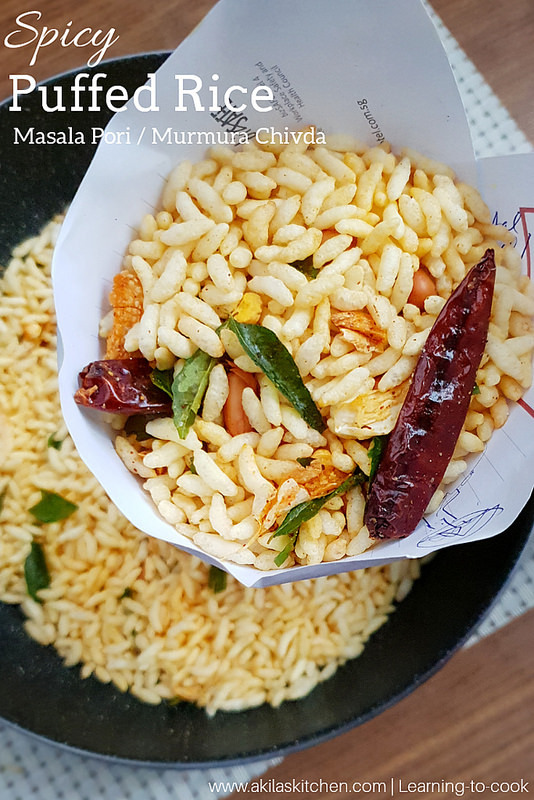 Masala Pori | Murmura Chivda | Spicy Puffed Rice recipe with easy step by step instructions and a video for your easy understanding. This Masala Pori | Murmura Chivda | Spicy Puffed Rice recipe is a very easy to prepare recipe and can be prepared in less than 10 min of time and is a healthy recipe too. 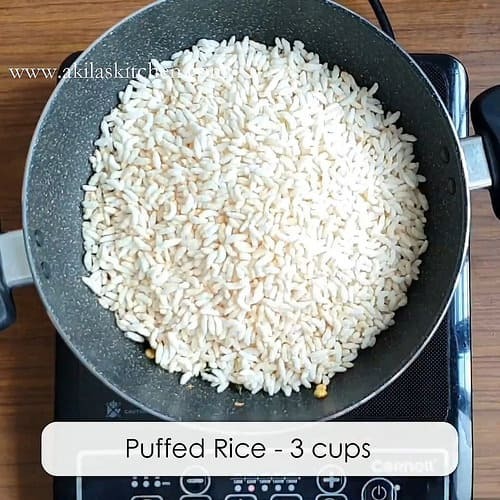 For festive days, like Vijayadasami or Vinayaga Chathurthi, we used to buy more Pori/Puffed rice and most of the time, it is left unused. So we can make this Masala Pori | Murmura Chivda | Spicy Puffed Rice using the leftover Pori. 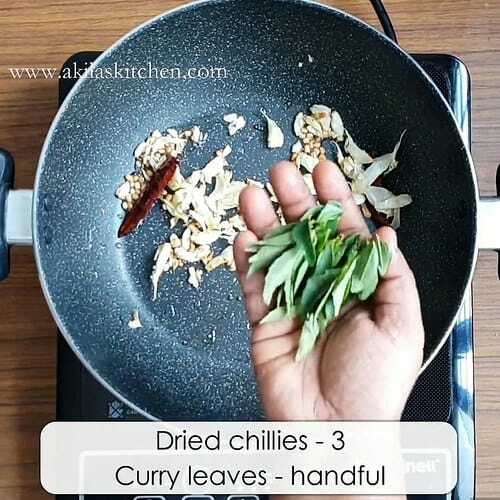 This can even be taken as a light evening snack or a tea time snack. 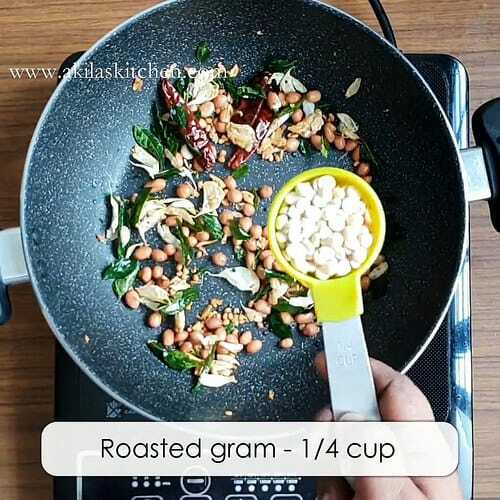 You can prepare this in large quantity and save it in a air right container and whenever you want to munch on something, you can use this. Also you can give this to kids as it is light as well as a healthy snack. 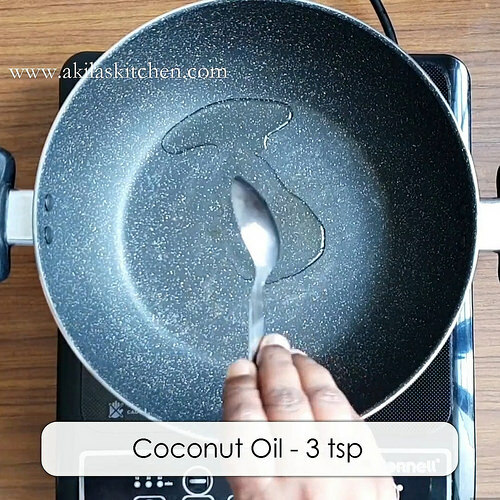 You can prepare this either coconut oil or in normal cooking oil. But when prepared in coco it oil, it gives a nice taste and great flavour. 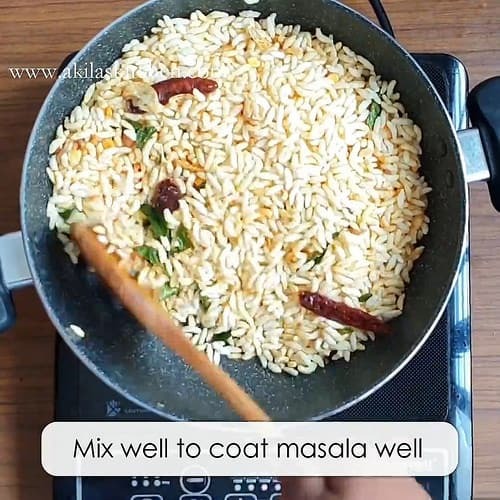 So try to use good coconut oil for recipe. Also check all the collection of easy evening snacks. 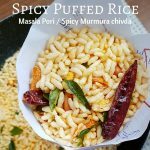 This Masala Pori | Murmura Chivda | Spicy Puffed Rice recipe is a very easy to prepare recipe and can be prepared in less than 10 min of time and is a healthy recipe too. 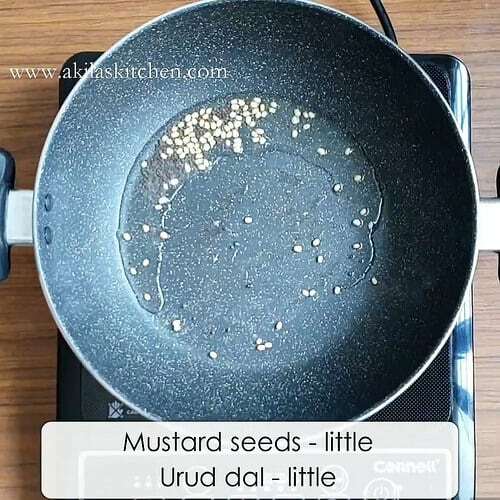 In a Pan, or wide vessel, add oil and when hot add mustard seeds and urud dal. 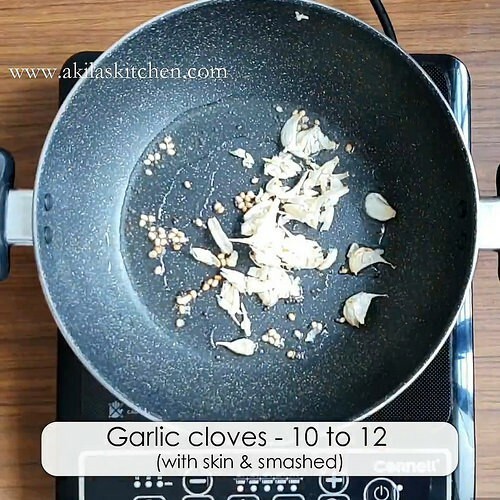 Add then rushed garlic and fry till it becomes light brown. 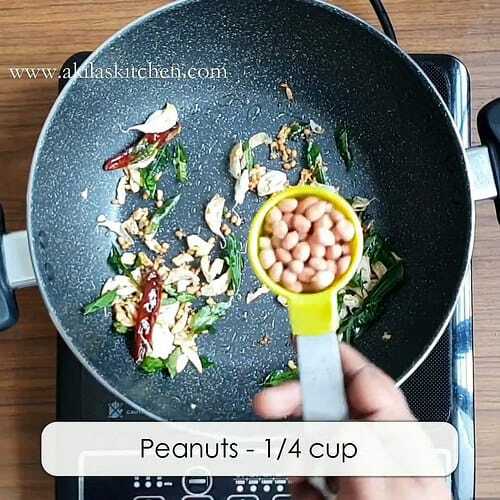 Then, add the peanuts, cashews, roasted gram, curry leaves, dry chillies and start frying it. 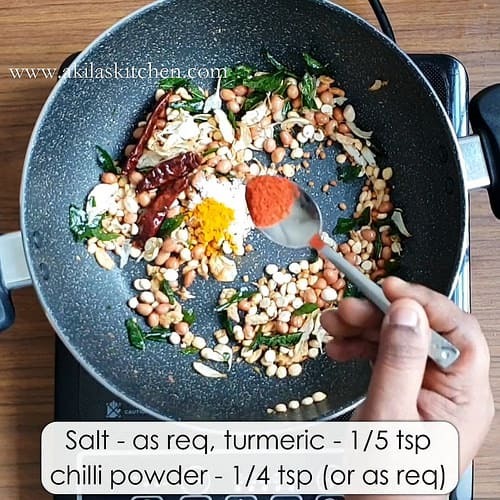 When the nuts becomes slightly brown, add the chilli powder, turmeric powder and Salt. 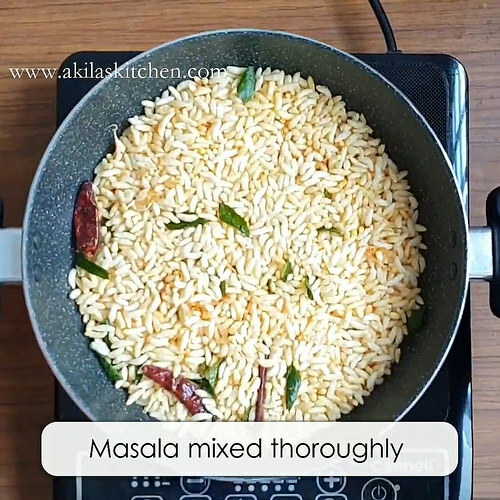 Add in the puffed rice and start mixing it worth the spices. Check for the spicies and Salt now and adjust accordingly. Add the sugar finally. (It is purely optional and I didn't add here). Great tea time snack is ready. It Can be stored in air tight container. Add the sugar finally. (It is purely optional and I didn’t add here). Great tea time snack is ready. It Can be stored in air tight container. 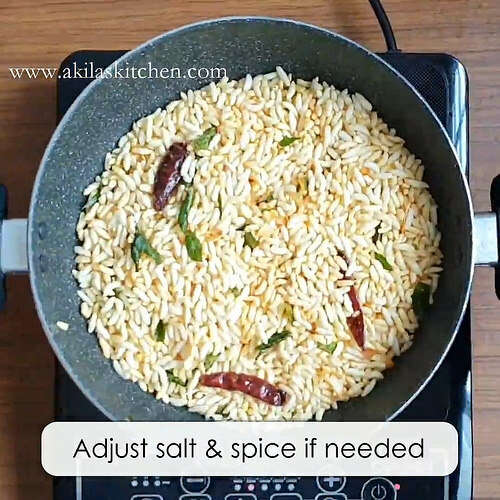 Tasty and spicy Masala Pori | Murmura Chivda | Spicy Puffed Rice is ready. 2. Adding sugar and cashews are purely yh optional. Cashews gives rich taste. 3. You can adjust the spiciness according to your taste buds. 4. When stored in airtight container it will be good for over a week. Nice quick snack with tea and a great prasadam too. looks so lovely and easy to make. I love this stuff. 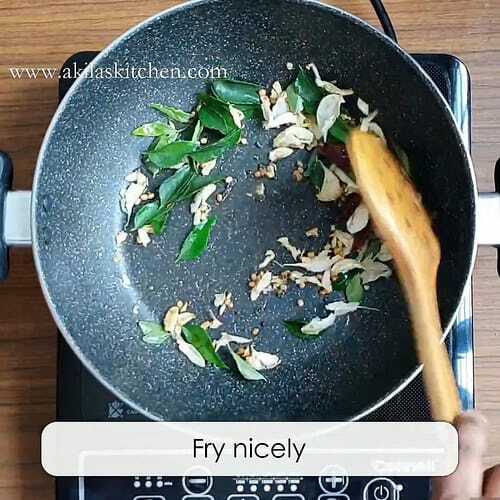 If you make it at home, you can totally control the oil amounts. Oh is it… Will try next time definitely… Thanks for the tips…. My Mom prepares this every time after ayutha pooja. Liked this version too. but if you add crushed garlic it adds nice flavor. Nice kara pori, love to have this snack at this cold weather. Akila meanwhile I have posted the picture of Kandanthippili in the step by step pictures. I love this one! Nice clicks!! 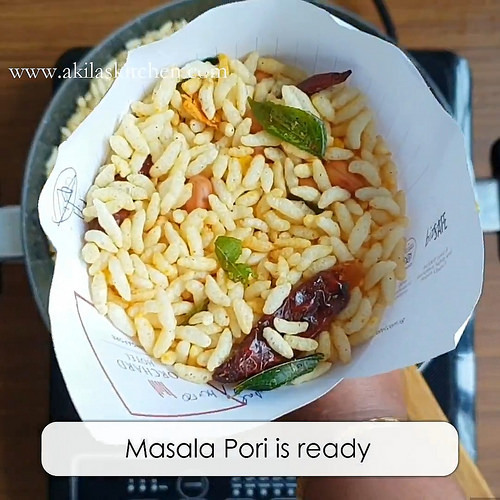 Perfect with tea,love the presentation..
Luv masala pori, perfect tea time snack. following u, wud b glad if u can follow back. A perfect snack when I am hungry and want something quick! None can resist to this masala pori,love it anytime. tempting and delicious evening snack..
Nice snack for tea time.